Here you will learn how to customize the Window Focus settings. To access these settings left click on the desktop and select System > Settings Panel from the menu. Click on the Windows icon at the top and then click on Windows Focus. The Window Focus tab lets you determine when you get the focus on a window and therefore start using it. What is the focus? Imagine you have two applications open on a screen, one is a word processor and one is an email application. If neither application has the focus and you start typing then nothing will happen (unless you are using a desktop environment that has keyboard shortcuts). If the word processing application has the focus then when you start typing the text appears within the document you are editing. If the email application has the focus then you will be able to use the keyboard shortcuts to choose menu options. Only one application can have the focus at any point in time and that is basically considered to be the program you are currently using. Most recent window under the mouse. The other option on this screen lets you raise windows when you mouse over them. You might notice that this screen has an "advanced button." If you click the advanced button you get a new screen with the following tabs. This screen is split into two sections. The first part deals with how you gain focus and has three options. The click option relies on you clicking on a window to gain focus. The pointer option relies on you selecting a window by moving the mouse pointer over it. Sloppy basically selects windows based on proximity. The most accurate is clearly click. Only dialogs with focused parent. The no window option means that opening a new window doesn't give you focus on it. The default option is all windows and therefore every time you open a new window you gain focus on it. The only dialogs option will only give you focus when you open a new dialog window (i.e. save as). Finally, the only dialogs with a focused parent will give you focus on a dialog but only if you are using that application. The stacking options let you determine when windows are raised to the top. If you have 4 applications open on the same desktop then you can choose to raise one to the top by simply placing the mouse over it. To do this check the box "raise windows on mouse over." If you check the raise window option you can set a delay using a slider control to delay the switch to a new application. This prevents you from accidentally switching to different applications constantly. Raise when starting to resize or move. The first option is self-explanatory. When you start to drag or change the size of a window it will automatically rise to the top. The raise when switching focus isn't checked automatically but should be. When you use alt and tab to switch applications it will automatically bring the window to the top. Activate If Visible On Desk. We would like to tell you what these options are for but there is a lack of documentation in this area and the support team for Enlightenment haven't been able to provide an answer as yet. The pointers tab has 2 main options and these options rely on using the pointer focus method on the focus tab. Prevent all forms of pointer warping. Slide pointer to a new window which is focused. There is also a slider available which can be used to set the speed of the pointer warp. So what is pointer warping? Well if you have a window open on a workspace and another window open on a second workspace and you switch desktops the pointer will automatically slide to the open window if you have the second option ticked. Always pass click events to programs. Refocus the last window on the desktop switch. Focus last focused window on lost focus. Let's deal with them one by one. The first option is again a mystery option with no real obvious documentation. The "Click raises the window" option automatically brings a covered up window to the top when you click on it if you have it checked and subsequently therefore when the "Click focuses the window" option is checked the window will also gain focus. The "refocus last window on desktop switch" option should reset the focus to the last window you were using last time you were on that desktop. Finally, when you lose focus to a window the focus is passed back to that window if you check the "Focus last focused window on lost focus". There are far more windows focus settings than you would expect to be able to tweak and this just shows the immense power that you have with the Enlightenment desktop environment. 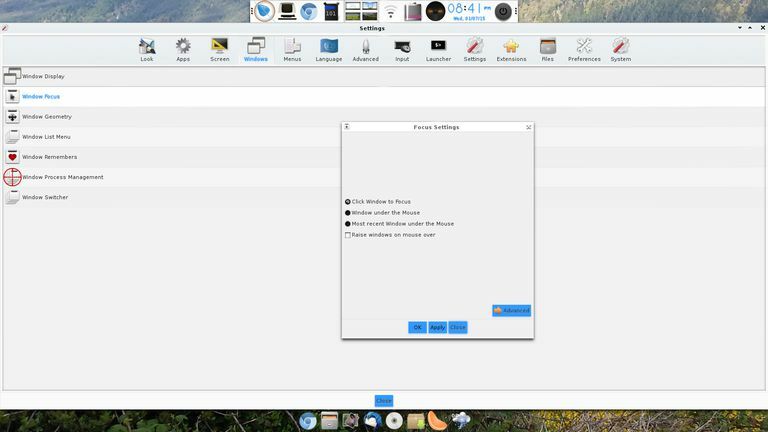 Here are the other tutorials showing how to customize Enlightenment include: changing the desktop wallpaper; applications; screens; Windows display.